Only one-third of intermediate-grade coronary artery stenosis (i.e. 40–70% diameter narrowing) causes myocardial ischemia, requiring most often additional invasive work-up with invasive fractional flow reserve (FFR). 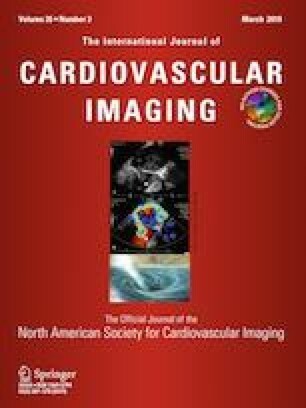 To evaluate the correlations between FFR estimates derived from computed tomography (FFRCT) and adenosine perfusion cardiac magnetic resonance (CMR) with invasive FFR in intermediate-grade stenosis. Thirty-seven patients (mean age 61 ± 9 years; 25 men) who underwent adenosine perfusion CMR, quantitative coronary angiography and FFR in the work-up for intermediate-grade stenoses (n = 39) diagnosed at coronary CT angiography were retrospectively evaluated. Blinded FFRCT analysis was computed on each intermediate-grade lesion and correlated to the FFR values. On adenosine CMR, subendocardial time-enhancement maximal upslopes, normalized by respective left ventricle cavity upslopes, were obtained distal to a coronary stenosis (RISK area) and in remote myocardium (REMOTE area). The perfusion was subsequently assessed without (uncorrected RISK) and after correction for remote perfusion (relative myocardial perfusion index = REMOTE/RISK ratio), and then correlated to the FFR values. Differences in correlations were tested with z statistics and considered statistically significant different at a p < 0.05 level. The average FFR value was 0.85 ± 0.10 (0.60–0.98 range), 28% (n = 11) was ≤ 0.80. FFR value correlated poorly with uncorrected RISK upslopes (r = 0.151; p = 0.36), but equally strongly with FFRCT (r = 0.675; p < 0.001) and the relative myocardial perfusion index (r = − 0.63) (p < 0.001; z = 6.72) for assessment of lesion-specific ischemia. Both FFRCT and adenosine perfusion CMR strongly correlate with invasive FFR measurements for intermediate-grade stenosis. These preliminary findings pave the way for further studies evaluating non-invasively intermediate coronary stenosis in clinical practice. The authors are grateful to Bracco imaging and General Electrics Healthcare for the study support. This study has received funding by General Electrics Healthcare. The funding has been used to cover the costs of the adenosine perfusion MR, the contrast medium and adenosine of all included patients. Funding for the FFRCT analysis was received by Bracco imaging. Jonathon Leipsic: Grant/Research Support: Edwards Lifesciences, Neovasc, Tendyne, HeartFlow, Samsung; Consultant: Circle CVI, Edwards, HeartFlow, Samsung; Stock Options: Arineta, Pi Cardia. The other authors of this manuscript declare no relationships with any companies, whose products or services may be related to the subject matter of the article. One of the authors, Dominique Hansen, has significant statistical expertise.